Producing a play at the Getty Villa almost resembles one of the trials of Heracles -- or maybe the journey of Ulysses. You'd think in such an idyllic setting, a semi-circular outdoor amphitheater nestled in a Malibu canyon on the doorstep of the building that houses some of the treasured urns of antiquity, you'd think that that setting would sprout plays as if from the head of Zeus. The biggest obstacle for theater at the Getty Villa is oddly the Villa itself. As impressive as the massive facade of the museum is, its effect is to dwarf an actor standing in front of it. Combine that with the steep rake of the amphitheater seats and the museum's prohibition on building any kind of set that can't easily disappear and doesn't mar the stone plaza -- and you begin to understand the problem. Oh, and it’s outdoors so a lighting designer's gift, of focusing the action down to a single actor, is muted at best. Performances that would seem outsized in most other theaters feel puny. The question is how do you engage the existing architecture and scale without falling prey to it? It's against this backdrop that you can appreciate how ingenious the set is for the current CalArts Center for New Performance's production of Prometheus Bound. Director Travis Preston and set designer Efren Delgadillo, Jr. have matched the Getty's scale with a massive five-ton steel sculpture. From the audience, it's as if you're staring into a three story tall, jet engine skeleton comprised of concentric steel circles. Or like a steam-punk fantasy of clock face: complete with a platform that rotates like the hand of time lifting Prometheus, and the play, up to match not only the audience but the height of the surrounding architecture. The set solves not only the challenge of the Getty but also the dramaturgical challenge of the play. Prometheus Bound is, after all, a play whose protagonist is bound, or in this case almost crucified, for sharing the gift of fire and civilization with mere mortals. Mr. Preston's architectural embrace doesn't stop there. He wisely elevates the action off the ground and into the audience aisles. He uses the museum's echoing surrounding space to create one of the most haunting sonic entrances I can remember. As Prometheus speaks of hearing a sound in the distance, you hear a fluttering, eerie call approaching from what feels like all sides. It's like a bird song, or a wave of female voices rolling in like a tide. No sound effect, you discover it's origin is a chorus of 12 women, the sea nymphs, speaking -- or is it singing -- in unison. They will make you believe that the mythical sirens really existed. I'll leave it to you to judge whether this same epic scale helps or hinders grasping the text of the play. Either way, it's a great excuse to catch a sunset in Malibu -- as if we needed a theatrical excuse to do that. 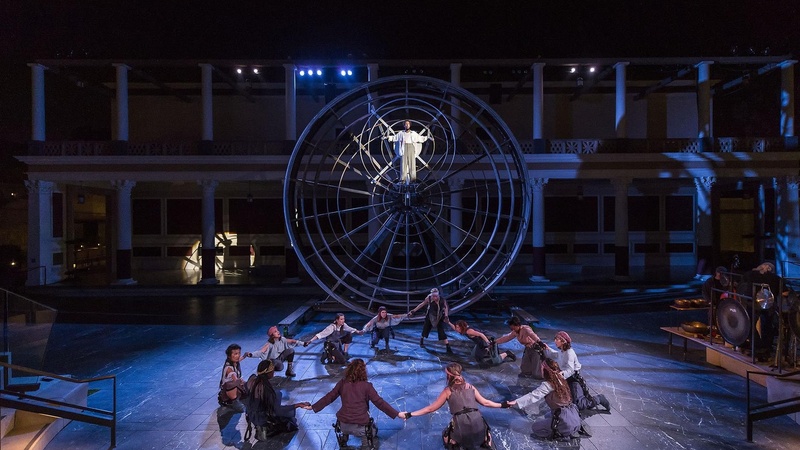 Prometheus Bound plays at the Getty Villa in Malibu through September 28.